"Having sourced LTL myself, I know that realizing and measuring savings is difficult. A firm that can deliver true value in addition to savings... the smoothest implementations ever experienced, ease of use, significant industry relationships... is hard to find. That's why I trust my clients with TranzAct." Total Transportation Spend Management is built on the bedrock of solid data. Often times, that data is made available through a reliable freight audit and payment function. 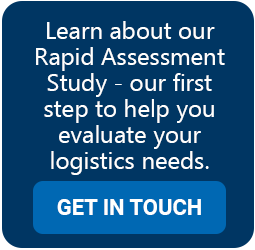 The insights provided through accurate freight audit and payment allows for a thorough supply chain anaylsis. From there, procurement events that produce LTL savings and truckload rates that can save a shipper millions are possible. TranzAct has established relationships with carriers that allow for shippers to obtain rates that can be truly realized--and sustained over time. And once rates have been established, our technology allows individuals within the organization to choose the correct carrier every time. Here are a few exampels of how Total Transportation Spend Management has workd for both shippers and carriers. One of the world’s Leading Distributors of Foodservice Equipment and Supplies distributes nationwide from its six full-service distribution centers, using its own fleet plus a network of national carriers. Although they stock over 12,000 items in their DCs, they source 50,000 items from a network of over 3,000 suppliers. Often, they will instruct their suppliers to ship direct to their customers, bypassing their DCs to expedite delivery and to save handling and transportation costs. Having gained insights into their shiping patterns as a TranzAct Freight Payment customer, they followed by implementing the Freedom Logistics program, which takes advantage of TranzAct's LTL network to procure and sustain significant LTL savings. While their primary motivation was to reduce LTL costs, they have discovered many other uses for tools provided. As a result, their savings over five years have been nearly 12% on a sustained basis. In addition, they have been able to employ the rating and reporting tools furnished with the Freedom Logistics program to shorten their order-to-cash cycle and monitor both carrier and supplier performance-to-plan. StarRate is a web-based rating/routing engine and optimizer that identifies the preferred mode and carrier(s) to use for a given shipment. Both cost and service comparisons are available. Further, use of StarRate can be extended to other information customers within, and external to, the shipper’s organization. The company then uses the integrated reporting tools to audit performance-to-plan to ensure that their suppliers use the proper carriers. In the event they do not comply with the routing instructions, the company will charge the suppliers back for the difference between the company’s rate and the actual movement rate. To accelerate their order-to-cash cycle, the company extended the use of StarRate to their accounting department. Accounting employs the tool on supplier-direct shipments to determine what the pre-paid shipment cost for the invoice should be (and that amount is added to the invoice). If they waited for the carrier freight bill to arrive before they produced the invoice for the product, there would be a substantial delay. They would have to receive the freight bill, match it to the order, and transcribe the shipment costs before the invoice could be completed and sent. Employing StarRate to pre-determine the shipping costs allows them to invoice the customer immediately. The reporting capabilities have been particularly important to the company during the past several years. When reductions-in-force occurred, repoting allowed them to continually measure and monitor both carrier and supplier performance-to-plan and ensure they received the maximum economic benefit from the Freedom Logistics program. The corporate traffic manager believes that Freedom Logistics is also helping them control their costs during this current environment of significant and unbudgeted rate increases. One of the largest Global Manufacturer of Bearings, Constant Velocity Joints, and Other Precision Industrial Equipment operates from nearly 70 plants worldwide. Their Senior Logistics Team Lead for Transportation Management stated that they were not technically sophisticated with their transportation and logistics systems and sought better ways to manage transportation and reduce costs. Previously, they employed ten LTL carriers but had no contracts with these carriers. Seeking to lower their LTL rates, they implemented Freedom Logistics as part of a program to reduce their Total Transportation Spend. The savings were significant. Last year, their savings from a $1.4M LTL freight spend were 42% (when compared to the rates they had prior to implementing the Freedom Program). Their savings over three years have been 34% on a sustained basis. These savings were achieved by following the Freedom Logistics procurement process. This resulted in a slight change to their carrier profile and a completely new rate structure. They believe that exposure to Freedom Logistics network carriers allows them to achieve lower rates and better service. As their distribution network changes (plants and distribution centers), they have the ability to immediately develop and implement a new book of rates for new facilities, and they have the flexibility to add or change trading participants as needs dictate. The company also sought to establish long-term relationships with their carriers to ensure stability and quality of service. The Senior Logistics Team Lead particularly praises the manageability of the system. While the procurement process yields lower rates and contractual relationships, they are provided with performance-to-plan reporting to ensure their key metrics are being met. They believe they get immediate attention to issues and problem adjudication. They also get transportation savings that are not only immediate, but sustained for years. Above all else, carriers want accurate and complete information when responding to shippers’ RFPs. It is a risk-avoidance need. The better the information, the more certain the carrier can be that their quotation will protect them from unanticipated costs and will yield the proper ROI. One of the Largest National LTL Carriers offers seamless deliveries throughout North America. They also offer expedited and specialized transportation services. Their Vice President for Corporate Accounts manages the relationship with all third party providers (including Freedom Logistics), which represents 25% of their business. He states that all third parties are not created equal. He believes that Freedom Logistics is an excellent service provider and presents them with the best quality information during the RFP process. He states, “Data is king,” and expands that they need granular geographic (lane) and product data to enter into their cost model if they are to develop the best rates for the customer--the better the data, the better the rates. This carrier has also just implemented a new costing model that fully allocates all costs, building in a refined overhead allocation that accounts for the cost of responding to, and administering, contracts. With this model, any provider that is difficult to do business with will see increased rates due to that administrative burden. He believes that Freedom Logistics is staffed with transportation experts -- that they can communicate openly and resolve issues quickly and equitably. In the event an account is not performing as planned, they have an excellent channel to address and adjudicate any issues. A major Regional LTL Carrier that operates in an 11 state geography has an outstanding service and safety record. Their Executive Vice President echoes what his national counterpart said above about the importance of data quality and completeness. He adds that they have had a long-term (15 years) and balanced relationship with Freedom Logistics and, although Freedom primarily represents the shipper, they are an excellent and fair trading provider. When the relationship began, Freedom approached this carrier to understand what the cost drivers were for them in an RFP. They then implemented the information gathering to ensure they responded to those information needs so this carrier (and others) got the information they needed to make pricing decisions. He states that no other provider approached them in a similar manner with similar questions! He believes that a good relationship is a critical success factor. Any issues are addressed immediately and issues can be resolved over the phone (without a long and onerous exchange of documents). Payments are made properly and on a timely basis in accordance with the contract terms. He praises the expertise and the professionalism of the Freedom Logistics staff and adds that the long-term stability of the organization adds to their peace-of-mind. The other services offered by TranzAct are complimentary and add to the organization’s credibility. Finally, he believes they have always been dealt with honestly, and the trust that grows from that way-of-working is invaluable.